Comece sua exploração de 5 dias na Ilha do Sul da Nova Zelândia com a coleta do hotel em Christchurch. Espreite através das janelas do seu treinador confortável no cenário vívido enquanto você viaja através do sopé dos Alpes do Sul. Seu guia faz uma parada em Mt Cook para o almoço (por conta do visitante) antes de sua primeira noite em Queenstown, incluindo tempo livre para explorar em seu tempo livre. Depois de um cruzeiro memorável em Milford Sound, aninhado no Fiordland National Park, listado pela UNESCO, você passará pelo Haast Pass até o Westland National Park, outro Patrimônio da Humanidade. A rota acidentada da Costa Oeste leva você a passar por cadeias de montanhas, florestas nativas e lagos até a imperdível Geleira Franz Josef, onde você passará a noite com vistas panorâmicas. No último dia, você viajará para a reconstruída cidade da corrida do ouro de Shantytown. Conclua sua turnê em South Island com uma viagem de trem de Greymouth a bordo do TranzAlpine Express. A rota leva você pelos Alpes do Sul através do Arthur's Pass até Christchurch, conhecida como uma das 10 principais viagens de trem do mundo. Viaje pela rica terra pastoril das planícies de Canterbury e pelas espetaculares paisagens do sopé dos Alpes do sul. Continue viajando pelo Burkes Pass antes de descer para o deslumbrante Lago Tekapo alimentado pelas geleiras e visitar a Igreja do Bom Pastor que fica no litoral. A partir daqui você viaja pelo lado oeste do Lago Pukaki para chegar ao Monte Cook, a montanha mais alta da Nova Zelândia. Parar no Monte Cook para o almoço (adicional a custo próprio), onde você ficará fascinado com o ambiente desta região verdadeiramente única. Atravesse o Lindis Pass, deixando o MacKenzie Country e viaje ao longo do Kawerau Gorge antes de chegar a Queenstown. Acomodação Noturna: Heartland Hotel Queenstown (ou similar). 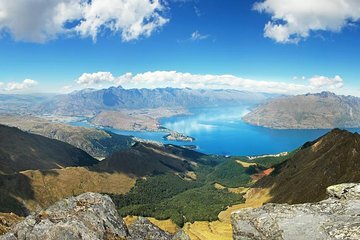 Viaje ao longo da margem do Lago Wakatipu, sob os acidentados Remarkables, até Te Anau, a "Porta de Entrada para o Parque Nacional de Fiordland". Ao entrar no Parque Nacional de Fiordland, você passa pelo Vale Eglinton. Veja a antiga floresta de faias, as impressionantes quedas d'água e os famosos Mirror Lakes, onde você fará uma pausa para uma parada de fotos. Continue pelo alto Hollyford Valley, passando pelas impressionantes Cataratas de Christie e entre no túnel Homer de 1,2 km, perfurado pela rocha sólida de uma montanha. Ao sair do túnel de Homer, prepare-se para o impacto de tirar o fôlego do vale de Cleddau e a descida para o Milford Sound. Na chegada, faça um cruzeiro inesquecível no majestoso Milford Sound, onde você verá as maravilhas do Pico Mitre e as paredes de pedra marcadas por geleiras que se erguem até 1200m verticalmente do mar. Em seguida, reúna o técnico para a viagem de volta a Queenstown. Almoços opcionais a bordo do cruzeiro estão disponíveis. Desfrute de um dia livre em Queenstown. Viaje ao longo das margens do Lago Wanaka e Hawea até a Haast Pass, a mais impressionante estrada da Nova Zelândia e porta de entrada para o Patrimônio Mundial Westland National Park. Inicialmente, o desfiladeiro atravessa as pradarias sem árvores de Central Otago, depois no ponto mais alto, os majestosos picos dos Alpes do Sul e os rios e florestas tropicais de Westland dominam a paisagem. Continue a percorrer a costa oeste, passando por cadeias de montanhas espetaculares, florestas nativas e lagos até as geleiras Fox e Franz Josef. A Geleira Franz Josef tem 11 quilômetros de extensão e mais de 7.000 anos de idade. Seu rosto terminal range e arqueia sobre a caverna da qual o rio emerge, pálido com rocha em pó e pode avançar ou recuar a mais de um metro por dia. Este "rio de gelo" vivo é imperdível para qualquer visitante da Nova Zelândia. Acomodação noturna: Scenic Hotel Franz Josef Glacier (ou similar). Hoje você continua a viajar pela acidentada Costa Oeste até Shantytown, uma reconstrução fiel de uma cidade da Westland Gold Rush. De Shantytown, viaje para Greymouth, o centro de milhares de escavadores durante as históricas greves de ouro da década de 1860. De Greymouth, viaje pelos Alpes do Sul, passando pelo Arthur's Pass e chegue a Christchurch com o famoso TranzAlpine Express. Esta jornada é conhecida como uma das dez principais viagens de trem do mundo. If you don’t like long 12 hour bus rides, this is not for you. Our only complaint were the bus drivers/ tour guides were difficult to understand and we speak English. Sights and activities were wonder and well organized. We thoroughly enjoyed this 5 day tour of the South Island. It is the best way to take in all the spectacular scenery of this special part of the world. The distances involved were long but the buses we rode in were comfortable. All of the drivers were professional and also made great guides as they provided commentary throughout the journey. The hotels we stayed in were all excellent. The best part was the trip through the Southern Alps on the TranzAlpine train. This is really one of the best rail journeys in the world. Our South Island itinerary was perfect.We saw snow capped mountains,fiords,rain forests,glaciers and the sea-all in 5 days.Whether traveling by coach,train or taxi/shuttle,because Viator was so organized,we were always on time.Coach drivers,Stuart and Peter, were outstanding with their commentary. Our trip from Christ Church to Queens town was not satisfactory. The driver guide almost missed us from the hotel. The van was small and packed. Beyond Queens town the trip was well organised and fantastic. We enjoyed everything. A good way to see many sights in South Island, in comfort with someone else driving! The coaches are comfortable but be prepared for the long distances covered. There are regular stops but they are usually very brief time for a quick coffee and visit to the toilet and little more. This is not a conventional coach tour. Each day is a different bus, different driver, different passengers, but the whole package was very well-organised and operated efficiently. The drivers all provide commentaries each has his own style but they are always informative and often very amusing. And the scenery, wow! Things are very much weather-dependent though. Franz Josef Glacier and the Trans-Alpine train journey were spoilt by heavy rain and poor visibility, and were it not for fine weather at Mount Cook, Milford Sound and in Queenstown my impressions might have been less favourable. It's a lot of money to spend and not see anything! The hotels were superb - the Millenium in Queenstown is very plush and the Scenic in Franz Josef more than adequate, with the unexpected bonus of a superb breakfast included. I felt some frustration at not being able to explore some of the sights more fully, but overall felt that this was the best way to cover a huge area and visit many spectacular locations in a degree of comfort. We chose this tour as it included many of the must-see sights in the South Island. This was accomplished by using a series of coach journeys linking places, picking up and dropping off travellers along the route. We were given short comfort breaks with an occasional stop at a place of interest. The exception to this was the very long day tour to Milford Sound for the two hour cruise which was breath-taking. The other highlight was the Trans-Alpine rail journey from Greymouth back to Christchurch which gave a view of many facets of the country side and areas almost inaccessible by any other methods of transport. The audio commentary headphones provided was well worth listening to, although many people didn't bother. The accommodation provided was adequate in Queenstown and excellent in Franz Josef. Overall we found it frustrating passing through places we will probably never visit again and not having the chance to look aroundeven at Mount Cook we only had an hour, so there was a choice between lunch or a short walk around, certainly no time to walk a trail! very interesting spots that were visited. however be ready to sit on a bus for about 8 hours each day. This is an excellent tour for a family who wants to see most of the South Island in a short time with less or no stress. You get the value for money and the tour was very well coordinated by the tour operator. Very well organized 5 days tour of the South Island. unfortunately, the weather was not so good and the Tranzalpine train was cancelled. The drivers were nice and prepared...the only thing was that they spoke too fast and with a strong accent, so we did not understand all. Thus, my suggestion is to supply travellers from abroad with the translated information, if possible. also, even if we saw many different beatiful sites, we made many hundreds of km each day, and that was a little bit tiring. In total, it was a nice experience. The hotels were fine.